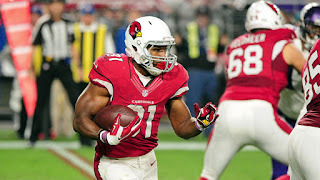 The Arizona Cardinals and fantasy football owners lost RB David Johnson to a wrist injury. In his place, Kerwynn Williams rushed for a red zone TD. Johnson's six receptions and 11 carries totaled 96 yards. It goes without saying that the #1 pick in just about every fantasy football draft is a very important player. For those without a reliable backup on their bench, start by putting in a waiver claim for Williams. As a backup plan, place claims on Tarik Cohen and Javorius Allen. The Bears 4th round pick out of North Carolina A&T rushed for 66 yards and gained 47 yards through the air, including an 18 yard TD reception. Jordan Howard is the guy in Chicago, but there are going to be plenty of touches available for Cohen. #Bears RB Jordan Howard did not speak to the media after the game. John Fox said he got banged up. Allen is in his 3rd year with the Ravens, out of USC, and Baltimore saw Danny Woodhead go out with a hamstring injury. Allen and Terrance West had two more carries (21) than West and rushed for 71 yards. Seattle's rookie RB Chris Carson is another player to target on waivers. The Seahawks offense looked awful against the Packers today, but Carson averaged 6.5 yards per carry. Eddie Lacy gained five yards on 6 carries. Keep an eye on LeSean McCoy's wrist injury as well over the next 24 hours. He appeared to be in a lot of pain, but did return to the game. Mike Tolbert rushed the ball 12 times today and vultured a TD with McCoy out on the sideline. Allen Robinson torn ACL confirmed.